Lavish your mid to late spring garden with splashes of brilliant colour with the Peony-flowering Tulip Collection. Like an Impressionist painting, these unusual double blooms feature soft, blurred edges and spring hues. Cherry red, tangerine orange, sunny yellow, rose pink and deep grape provide a touch of whimsy. Your collection of tulips shines with double-flowered Abba, Monte Orange, Monsella, Royal Acres and Foxtrot tulips. These long-lasting perennial tulip flowers are hardy in zones 3 through 8 and prefer locations that receive full to half sun. 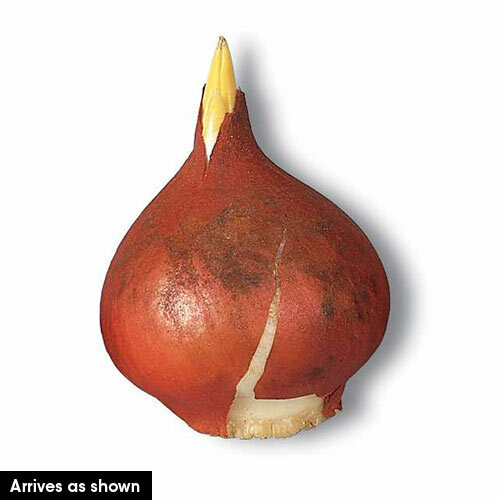 We recommend that you plant these Dutch bulbs in the fall, about 4 to 6 inches apart and 3 inches deep in well-drained clay, loamy or sandy soil. 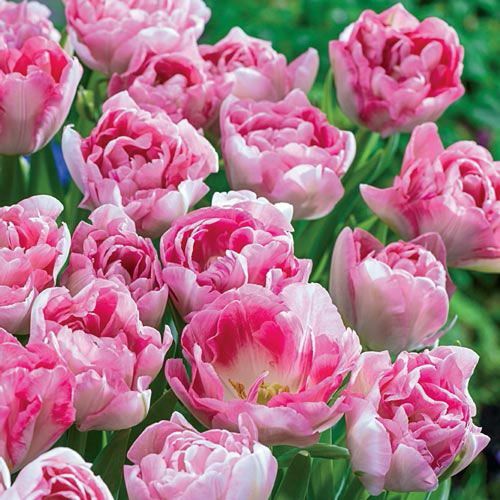 Peony tulips spread between 6 and 12 inches and heights will range from 14 to 18 inches. The bright colour palette of the flowers in this tulip collection are like a Monet painting brought to life, with fanciful colours and a hint of mystery. Pair these lovely flowers with cheerful nodding daffodils or majestic Dutch iris for a look of romance and peaceful beauty. Peony tulips add surprise with their elegant, frilly blooms when planted in groups in a formal garden or as a touch of charming whimsy in containers. Create an artist's delight with the amazing Peony-flowering Tulip Collection. So Much like Peonies, You'll do a Double Take! For decades, tulip breeders have been working to perfect double-flowered tulips, and the results have been astonishing. Thanks to our relationships with top growers, we are now able to bring the best double tulips in the world to Breck's customers. 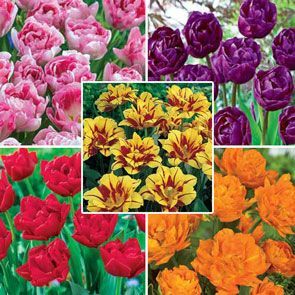 The five varieties in our new Peony-Flowering Tulip Collection will add interest and dimension to your tulip beds that may have been missing until now. These double-flowered tulips may look like peonies, but we assure you, they're tulips through and through! Blooming among your other mid-spring bulbs, their petal-filled blooms will last longer than single-flowering varieties, as long as they are planted in an area protected from harsh winds. As a cut flower, these tulips are extraordinary—fragrant and full, with enough colour and substance for weeks of beautiful bouquets. Double-flowering tulips are so packed with petals, it's easy to mistake them for other blooms—especially peonies. We've gathered five of our most peony-like tulips into one incredible new collection, guaranteed to impress (and maybe even confuse) visitors to your garden. Abba Tulip: Roll out a fragrant re carpet! 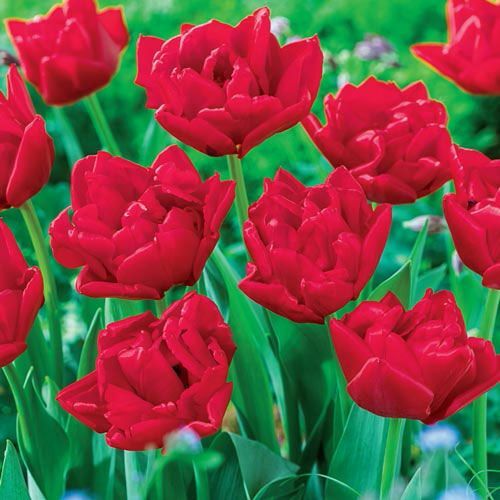 Eye-catching, bright red blooms provide a traditional tulip colour in a surprising double form. Besides the large main flower, this variety often produces additional smaller blooms. Height: 14-16''. 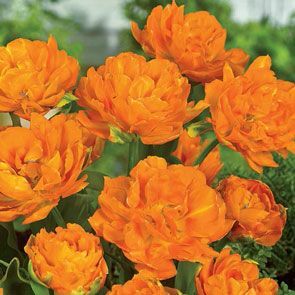 Monte Orange Tulip: Gorgeous tulip bears twice the amount of petals as other double varieties, and expands to reach an astonishing 6" across when in full bloom. The lush orange colour, sturdy upright stems and enticing aroma make Monte Orange® a must-have for cutting gardens and borders. 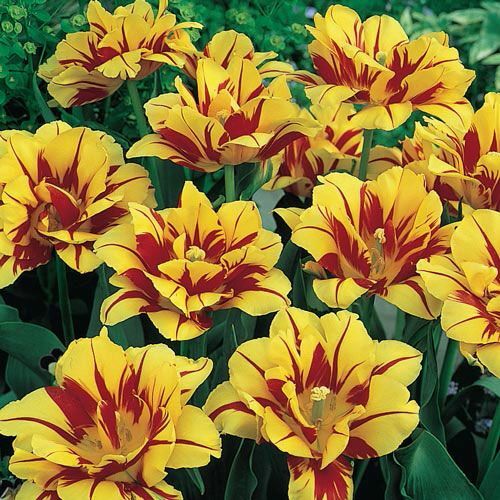 Height: 16-18"
Monsella Tulip: Monsella's unique double form is almost as intriguing as its dramatic colour combination! Canary yellow blooms look hand painted with rich red streaks and open to a full 6" across. Get ready for compliments! Height: 12-16"
Foxtrot Tulip: Possibly the most peony-like of all, blooms start out white and mature to varying shades of pink. Slightly ruffled edges on the petals add to the illusion. Flowers do not smell like peonies, but are wonderfully fragrant. Height: 14-16". 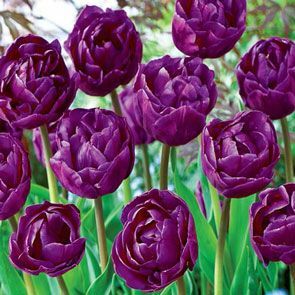 Royal Acres Tulip: Royal purple outer petals are slightly frosted and open like a treasure box to reveal layers upon layers of petals. Planted en masse, they're a spectacular sight. Also great for front borders and containers, where their slightly shorter stems will be an asset. Height: 14-16".